M.L. Kishigo's 1166 and 1167 4-Season Ultra-Cool™ Mesh Vests feature adjustable side closures that allow workers to wear them over a T-shirt in the warm months or over bulky winter outerwear when the weather cools, thus allowing for multiple sizing and reducing orders for specific sizes. 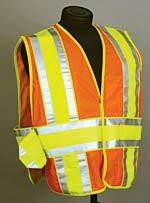 The ANSI Class 2-compliant vests feature two 1-inch-wide silver reflective strips. Booth 1867.